Like the reverberating echoes of the tower chimes, Carolina Bell Ringers’ support touches every corner of campus to help strengthen the foundation that makes Carolina great. Carolina cannot be all that it is without their continued support. Annual gifts define the University’s ability to be a great research university that excels in educating students at all levels. Membership in the Carolina Bell Ringers requires donors to have made gifts in the most recent two consecutive academic years. We welcome anyone to join, both alumni and other friends of Carolina. Your gift may be designated to the Chancellor’s Unrestricted University Fund or to any school, academic program or department of the University. To continue your Bell Ringers membership in academic year 2017-18, simply give any amount prior to June 30, 2018. There is no minimum gift to continue your membership. At the end of each academic year, all Bell Ringers will receive a car decal, an acknowledgement from the Chancellor of their important role in Carolina’s annual giving efforts, and the satisfaction of helping Carolina maintain its status as a premier public university. Bell Ringers is administered by the Annual Giving department. Contact its staff for more information. The 1793 Society: a distinction based on annual support totaling $2,000 – $4,999. The Carolina Society: a distinction based on annual support totaling $5,000 – $9,999. The Chancellor’s Circle: a distinction based on annual support totaling $10,000 – $24,999. The Cornerstone Society: a distinction based on annual support totaling $25,000 or more. Carolina’s most dedicated donors aren’t generous just once, but over the entire course of their lifetimes. Chancellor’s Council members meet this standard, and then some—we salute those whose cumulative giving has reached $100,000 or more. For more information on membership, contact Leadership/Office of the Vice Chancellor for University Development. The Gerrard Legacy Society recognizes the hundreds of alumni and friends who have remembered Carolina through planned gifts. All alumni and friends who document their planned gifts will be welcomed as members of this society. 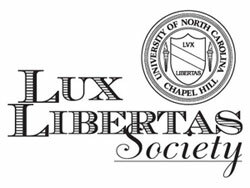 Carolina recognizes its most devoted supporters through the Lux Libertas Society. The society takes its name from the University’s motto etched in its official seal—Lux Libertas, Latin for “light and liberty”—and pays tribute to donors who have given Carolina $1 million or more in cumulative lifetime gifts. Society members have shown extraordinary commitment to ensuring that the University remains what former University President Frank Porter Graham described as “an outpost of light and liberty” for today’s generation and beyond.